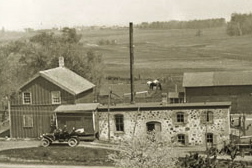 The second cheese factory on Saxon Homestead Farm in 1912. As the coming of spring rouses Mother Nature from her winter’s slumber, we tap the sugar maple trees in our woods and boil the sap into pure maple syrup in our renovated nineteenth-century cheese factory, built in 1872. 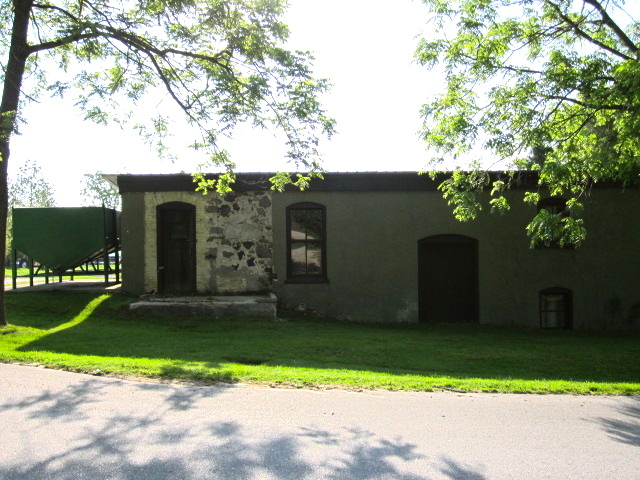 Interestingly, this building is not the oldest building on our farm. Our granary and historic barn, in which we hold a variety of events, including barn dances, fundraisers and family weddings, precede the cheese factory. We now will walk you through the maple syrup production process, from start to finish. If you would like to experience the process first-hand in any or all stages, let us know! Come late winter, we could use extra willing hands. In addition to an extraordinary process, you will experience the taste of wood-fired pure maple syrup! If you would like to purchase our maple syrup, please contact us. Tapping the trees: In mid-February or early March, weather-dependent, we drill small holes in the sugar maple trees in our woods (“tapping”). We then insert stainless steel spiles (“taps”) into the drilled holes, and on each spile hook we hang a white five-gallon bucket. Collecting the sap: After we’ve tapped the maple trees, we hope for warm days (in the 40s) and cold nights (in the 20s), weather conditions that prompt a steady flow (“running”) of sap. Some days hardly any sap will flow, while on other days buckets will overflow, depending on the weather. Collection days require a lot of willing hands as we empty all the buckets into transport tanks. When full, we bring the large tanks to the farm and pour the sap into a storage vat. 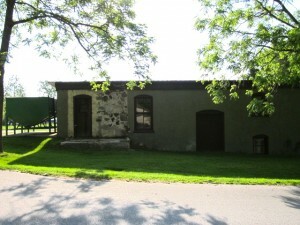 Now we make maple syrup in the 1872 cheese factory. Boiling the sap: It takes about 10 gallons of sap to make just one quart of maple syrup, and, in a given spring, we produce several hundred gallons of it! In our renovated cheese factory, we have an excellent set-up for maple syrup production. First, we boil the excess water from the maple sap. The boiling process may take several days. Then, we bottle the pure maple syrup in glass bottles of several different sizes. We celebrate the success of the maple syrup season by grilling out our grass-fed finished meats to feed all helping hands.